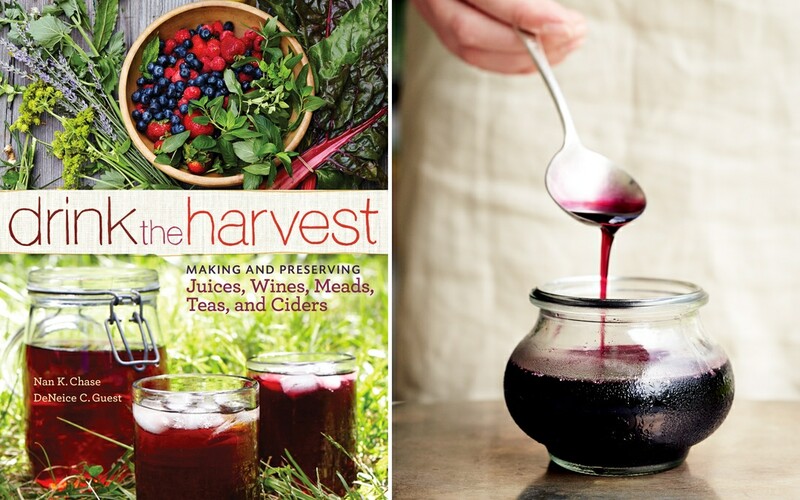 Authors Nan Chase and DeNeice Guest share these unique recipes for Berry Juice and Blueberry-Basil Syrup from their book Drink the Harvest: Making and Preserving Juices, Wines, Meads, Teas, and Ciders (Storey Publishing, 2014). Berry Juice is thick and delicious. This recipe works well with blackberries, raspberries, gooseberries, blueberries, serviceberries, currants, and other ripe berries, either alone or in combination. Use Berry Juice as a pure juice drink or in a smoothie, as a flavor base for carbonated beverages, as a mixer for alcoholic drinks, as a topping for ice cream or other desserts, as a main ingredient in ices and frozen treats, as a milk substitute with cereal, or as an ingredient in baking recipes (to color icing, for instance). Berry Juice is also a super health drink with cancer-fighting properties, in addition to vitamin C and various trace elements, dietary fiber, and compounds that boost heart health, all bound up in a gorgeous package. To keep the flavor lively and the color true, add both ascorbic acid and a little sugar during the canning process. 1. Put the berries into a large nonreactive stockpot, and then add filtered water to barely cover the fruit. Bring the contents to a boil. 2. Reduce the heat and simmer for 10 minutes, stirring and mashing the berries as they cook, or use an immersion blender to grind the berries. Stir occasionally to avoid sticking, and skim off any foam. 3. Line a large colander with two layers of cheesecloth dampened with filtered water. Set the colander over a large bowl, making sure that the colander sits well above the bottom of the bowl so that the juice can flow freely. 4. Slowly pour the hot berries into the colander. 5. Leave the juice to strain for at least 1 hour. Do not squeeze or force the berries through the cheesecloth, or the juice will become cloudy. 6. Refrigerate the juice overnight in a clean covered container to let solids settle to the bottom. The juice will clear. For canning, ladle the juice out and discard the solids. This juice can be used immediately or preserved by canning. Fill the jars with liquid, leaving ¼ inch of headspace. Apply sterilized lids and bands, being careful not to overtighten. Process both pint and quart jars in boiling-water bath for 15 minutes, adjusting for altitude. If the syrup is allowed to boil too long, it will thicken into jelly and not pour from a bottle. This happy accident happened to us, but the resulting jelly was delicious. It’s perfect on toast, or served with sliced meats and cheese, adding a bit of savory sweetness to any appetizer. Use this unusual recipe for almost anything at all; it has a sophisticated and unexpected flavor that preserves the complexity of basil with the heavy fruitiness of blueberry. Raw cane sugar, rather than white sugar, imparts even more flavor notes, creating a dark, velvety liquid. You can make blueberry juice following the recipe for Berry Juice above. Try to avoid splattering as you cook, because blueberries will stain. for the basil. The result is subtly spicy and makes a wonderful addition to cocktails or any recipe calling for a glaze. 1. Combine the juice, sugar, and basil leaves in a saucepan, and bring to a full boil. Reduce the heat, and simmer 5 minutes. Skim off any foam. 3. Add ascorbic acid if needed and stir. 4. Strain out the basil leaves. Pour into sterilized containers, seal, and label. This syrup can be used immediately or stored in swing-top bottles for up to a year with ascorbic acid added, or six months without it. Store in the refrigerator for up to two weeks after opening.